Does rotting fish belong in beer? What turns drink sour: microbes, or thunder? Struggling under the combined effects of a thumping hangover and a temporal paradox, will our traveller be able to avoid the fallacies of historiographical presentism and avert the invention of keg bitter? Clearly not. Fortunately, his time machine has a mind of its own, and can give a far more sober version of events based on painstaking historical research. Really. See the video page for more extracts from the production. 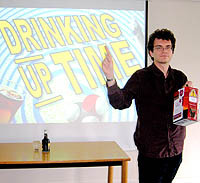 Drinking Up Time was created as an experiment in putting across unfamiliar historical ideas through familiar examples. It grew out of work developed by and for the British Society for the History of Science and the University of Manchester, and was developed by an academic historian who is normally far too sensible for this kind of thing. See also the notes on the aims of the project, and a piece I wrote about it for the BSHS. Its first appearance was at the Manchester Science Festival in 2009, playing to a capacity crowd (in a tiny room above the Lass O’Gowrie in its Sharaz Jek artwork days). It returned to the Manchester Science Festival in 2010, and featured at the British Science Festival in 2010 (Birmingham) and 2011 (Bradford). Anyone interested in booking Drinking Up Time as part of a history, science or other public events programme should contact the organiser directly. Pub venues with excellent beer strongly preferred.